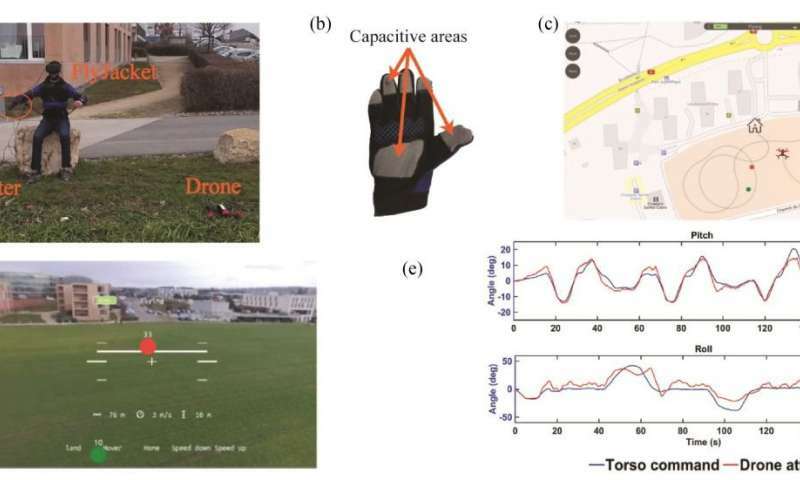 A drone you can control with your body? You guessed it. The technology at play is in the form of an exosuit. A Swiss team stepped up to the challenge of making one to do just that. A video published recently presented their FlyJacket. EPFL (Ecole Polytechnique Federale de Lausanne) presented the video along with the Swiss National Center of Competence in Research. This is an upper body soft exoskeleton. You know what that means? Goodbye joysticks and remote controllers during operations. In tests with FlyJacket users, reactions were that they were "feeling more immersed with a greater sensation of flying while experiencing less discomfort than when using conventional controls," said James Holloway in New Atlas. One big advantage is that beginners would feel more confident about exploring the drone-flying experience without doubts they may falter and fail. "Wearable interfaces could enable a more natural and intuitive control of drones," said the video notes. How intuitive? Spread your arms and make believe you are flying. One can use upper body gestures. Evan Ackerman in IEEE Spectrum said, "the exosuit doesn't require much in the way of training since it's inherently so intuitive." Carine Rognon, one of the members of the EPFL team, told IEEE Spectrum that they wanted to make the interaction between drone and human more natural—to create a symbiosis between them. The exoskeleton has (1) a motion-tracking device to track body movements (2) arm support system to prevent fatigue, and (3) accompanying goggles for view from the drone perspective. From the drone's perspective? James Holloway in New Atlas: "The pilot wears a virtual reality headset or other head-mounted display so they see what the drone sees from its front-facing camera." The exosuit was developed at EPFL's Laboratory of Intelligent Systems, led by Professor Dario Floreano. The researchers authored a paper about their work. Rognon, C., Mintchev, S., Dell'Agnola, F., Cherpillod, A., Atienza, D., & Floreano, D. are listed as the authors of "FlyJacket: An Upper Body Soft Exoskeleton for Immersive Drone Control" in IEEE Robotics and Automation Letters. The FlyJacket is demonstrated for the teleoperation of a real drone. In reporting results, authors said in their study participants felt more immersed, had more sensation of flying, and reported less fatigue when the arm support was enabled. Ackerman wrote, "you end up feeling the motion of the drone with your body, providing feedback that you don't get with a controller. People also reported feeling less VR-induced motion sickness, which may be due to less of a disconnect between the motion that your eyes see and the motion that the rest of your body (and especially your inner ear) feels." Their paper discusses their assessment of the suit for use in drone control. They carried out tests that involved connecting the suit to drone simulation software and quadcopters to mimic the flight dynamics of a fixed-wing drone. They enlisted 32 participants (25 men and 7 women). They would control a simulated fixed-wing drone wearing the FlyJacket, or with a remote controller. In both cases, they used virtual reality googles (Oculus). They flew a drone in a simulator developed in Unity3D. At the end of the experiment, participants filled out a questionnaire. They were asked about comfort and immersiveness. Regarding physical comfort, participants rated a significantly higher discomfort with the remote controller than with all the flight conditions using the exosuit. They found that the exosuit's performance compared to that of a conventional remote control. The system, said the authors, can easily fit in a backpack and be transported in the field. You certainly are not free to do anything else while you are flying the drone are you. If you are a soldier that's all you could do. Here's one for you how about a joy stick control that you could use to guide the drone? Yeah that's it a joy stick. WOW Send your check to Texas.